Giving an account shell access provides the user with command line access to your server via SSH, which can be very useful when in the right hands. Shell access is restricted by an account’s permissions, but giving an account shell access does bring with it some intrinsic security risks. Most clients will not have the slightest clue how to use SSH, so you probably shouldn’t include it in low-end packages by default. 1) Let’s proceed. Go to Account Functions. 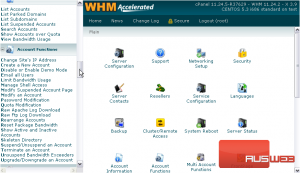 2) Click Manage Shell Access. 3) Hit the Enable Normal Shell button next to an account to enable standard shell access. 4) Return to the previous page via this link. Notice: the user’s shell is no longer disabled. Also, the Enable button has changed to Disable. Instead of giving users standard shell access, you can also give them jailed shell access. A jailed shell environment prevents access to data outside of the user’s home directory, which decreases the security risks of granting shell access. 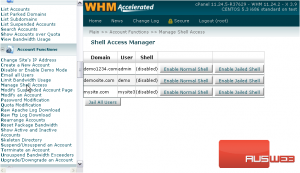 Provide jailed shell access per account using the button in the correct row. Or, click Jail All Users to make every user have a jailed shell. This demonstration is now complete. 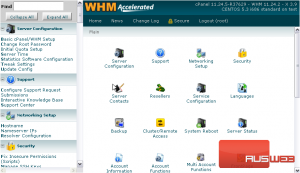 You now know how to manage shell access in WHM.